If only 10 collaborative projects can touch nearly every state in the country, imagine what 1,000 collaborations could do. 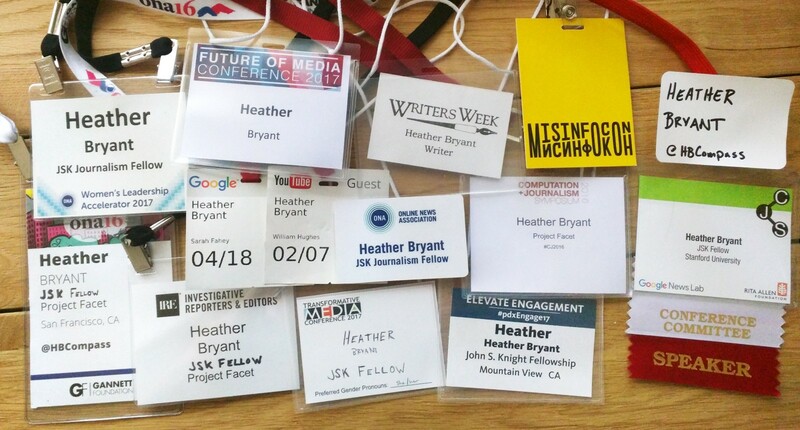 When I first started thinking about collaboration between news organizations from a logistical and cultural perspective a few years ago, I thought that it would be my job to help convince newsrooms that collaboration is something that they needed to do. I thought that was the fight that needed fighting, but I’ve come to see it differently. Like anything, trying to convince someone to do something new is inherently difficult. Remember back when we were trying to convince people that sharing stories on social media was a thing that we should do because that’s where audiences are? When I knew I was going to be a John S. Knight Fellow, I pivoted in my framing. Rather than spend my time negotiating and debating, I would spend it reporting. I wanted to talk to as many people as possible who were interested in collaboration or already doing collaborative projects. I want to know what’s working, what’s not and what needs to be better. How do we help newsrooms that want to collaborate build effective, meaningful collaborative projects or improve the ones they already have? So I did a lot of listening. And also a surprising amount of talking, at least for me. The irony of being fascinated and passionate about collaboration while being profoundly introverted is not lost on me. I challenged myself to say yes to every invitation to talk about collaboration and every invitation to hear smart people to talk about collaboration, community, trust and engagement. I’ve spend a lot of time on planes, phones and webinars in the past 10 months. And people had extraordinary things to say. I’ve profiled a few of these conversations and am continuing to do so beyond my time at Stanford. If you have an experience with collaboration that you’re willing to share, I’d love to talk to you. Collaboration is a high impact methodology for addressing some of the most pressing challenges in journalism. Partnerships enable you to cover stories that you lack the resources to cover independently. Partnerships can help you foster diversity when you are not able to hire. Partnerships allow you to both obtain and provide expertise needed for complex stories. Partnerships between newsrooms expand the reach of content that needs larger audiences. Partnerships create access to new topics, regions and sources without duplicating efforts. Partnerships help you create power and leverage that you might not have alone. Partnerships can focus attention of the public on important stories by coordinating coverage. Successful collaborations work like magnets. There has to be a mutual attraction. Building blocks are inert objects. They don’t work together unless and outside force sticks them together. Magnets are drawn to each other to form connections. Connecting the right people with the motivation to make it work matters. Collaborations can be temporary or long-term, and thinking about what you’re in for upfront is an important consideration to make as you figure out what collaboration looks like for you. The bond between magnets can be incredibly strong, but it doesn’t have to be permanent. The arrangement can change and take different shapes. The flexibility is important. Your relationships with other organizations are going to change over time, whether it’s driven by changing people or the evolution in missions and goal. Your partnerships can similarly take new forms or separate if that time has come. The pieces don’t have to be the same size and shape to connect successfully. The vast majority of partnerships do not exist between identical organizations because identical organizations do not exist. There will always be a difference in resources but that doesn’t have to hinder your collaborative work as long as you have clear communication about expectations and goals. You can build with multiple pieces something you could not with only one. Collaboration makes possible what is not possible alone. If you’re just getting started or you’re down the path a ways and finding it a little bumpy, here are some questions that can make the going a little easier. The challenge for us is that most newsrooms were built to either compete with other newsrooms or operate agnostic of the existence of other newsrooms, we didn’t design for collaboration. What are the goals of the partnership are you looking for? What values are important to you or your organization that need to be important to your partners? What do you need to get out of the partnership? How will you define success and how will you measure it? Is everyone involved fully committed to the work that’s necessary for success? Depending on how formal your partnerships are, will change the level of detail you need to work out, but here are some questions to start with. Who is responsible for managing the partnership? What will the editorial process look like? 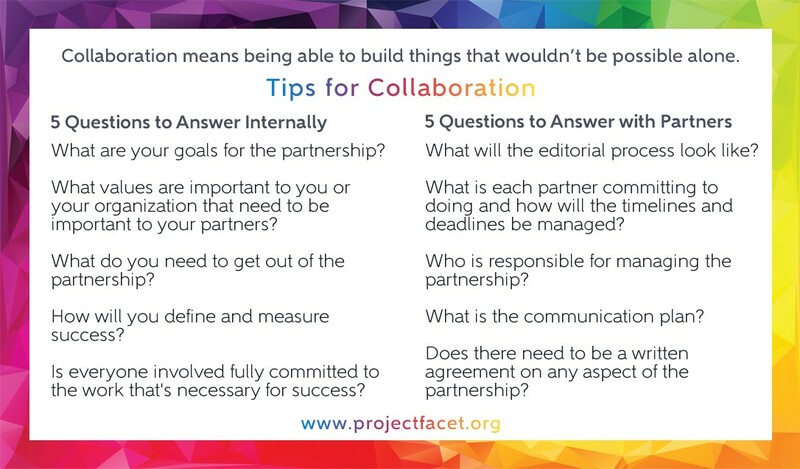 What is each partner committing to doing and how will the timelines and deadlines be managed? Does there need to be a written agreement on any aspect of the partnership? Here’s the printable card version from NewsFest. The end of my time at Stanford is only the beginning of my continued work in this space. Project Facet, an open source web based platform that facilitates the logistics of managing and doing the work of collaborative journalism is a prominent staple of my work and will continue to be so. Facet is the only editorial tool designed to enable newsrooms to work together. Facet makes it possible for newsrooms to collaboratively create content, distribute stories and assets and manage collaborative projects in a seamless environment. I’m continuing to profile collaborative partnerships to collect as much wisdom as possible to benefit the collaborative community at large. 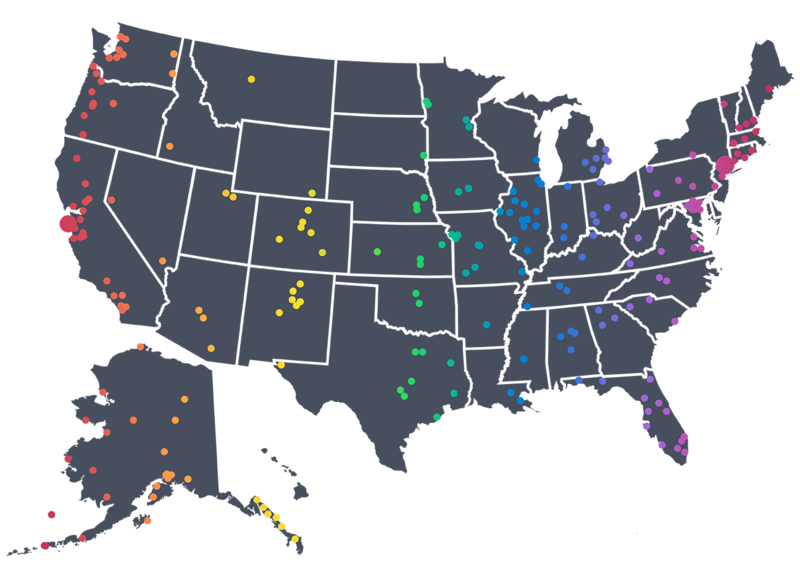 I’m collecting data in order to map the geographic spread of collaborative reporting projects and to get a realistic look at newsrooms across the country regardless of platform. I’ll continue to work on my research and conversations about rural and local newsroom partnerships both with each other and with regional and national organizations. There is much opportunity in this space for rethinking distribution patterns and making intentional efforts to elevate local coverage from under-covered and poorly-covered communities to a broader range of audiences that would benefit from exposure to those stories. I’m fascinated with early anecdotal evidence and discussions about using collaboration and distribution agreements between newsrooms as a way of building audience trust in media as a whole by strategically building upon trust at a local level and want to continue looking at that area. I’m also looking at the myriad ways newsrooms can partner with non-news entities in order to better cover the world. Collaboration between newsrooms is a powerful thing and I’m optimistic about the future of journalism because of it. If you’re worried about taking your organization down the road of collaboration, you shouldn’t let that stop you. The collaborative journalism space is a place where you’ll find yourself in good company, surrounded by some incredibly talented people doing important work. Whether it’s the nearly 300 people that have sought out the Collaborative Journalism Slack community or the more than 100 that took part of the first Collaborative Journalism summit, there are people out there that want to share, partner and do damn good journalism. Heather Bryant is a JSK Fellow at Stanford working to help newsrooms build effective and meaningful editorial collaborations and partnerships. If you’d like to be a part of the conversation, please join our Slack community. Are you part of a newsroom or organization that has participated in collaboration? I want to speak to you. Director of Project Facet, building the infrastructure for effective, meaningful collaboration with newsrooms. The future of journalism is collaborative. Facet is the infrastructure that empowers newsrooms to manage the logistics of creating, editing and distributing content, managing projects and facilitating collaborative relationships.